We want to learn how to create a copy of a DVD that you already own. Yes, legally own, of course. Use this information responsibly. As with almost any form of knowledge, like "Hydrogen burns in the presence of oxygen! ", it could be used to do something that might be illegal where you live. Maybe you are going on a business trip and you would like to take along a DVD that you own. But you don't want to run the risk of forgetting it and leaving it in the DVD player in the hotel room, losing your only copy of what might have been difficult to find. 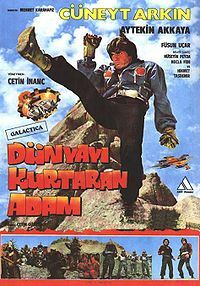 For example, the legendarily rare director's cut of Dünyayı Kurtaran Adam. Almost all commercially produced DVDs use the Content Scramble System or CSS. It is a rather weak stream cipher system using a 40-bit key. A 40-bit keyspace is not all that large to start with, and the implementation makes the system even weaker by only using a much smaller subset of that keyspace. 450 MHz x86 processors are adequate for a brute force attack requiring only minutes. To briefly explain the CSS architecture, a set of player keys is known to DVD drive manufacturers and, no surprise, also known to others. The lead-in area of the DVD has a disk key, and there will be at least one title key for the encrypted video file itself. Both the disk key and title keys are stored in ciphertext form. The title key is encrypted with the disk key, and the disk key is encrypted with the player key. Do not look at these colors! This gaudy "Free Speech Flag" embodies a 16-byte number that we are not supposed to know in the hexadecimal (R,G,B) values of its five stripes followed by the byte 0xc0. The disk and title keys are just five bytes long, 40 bits. The player keys are six bytes long, and are considered as trade secrets. Lawyers can insist on strange things that make no sense. See, for example, the AACS encryption key controversy and the strange legal concept that somehow there are numbers that are illegal for you to know or utter. There is a haiku description of the CSS algorithm and its reversal that reveals the use of these keys and even the value of one. 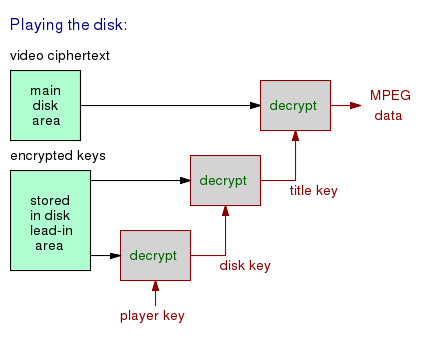 The DeCSS algorithm is based on a reverse engineered player key. If you accept the premise that laws can make it illegal to know certain numbers, then DeCSS should not be used as it's based on that forbidden knowledge. An alternative is the libdvdcss library, which generates some possible player keys and then, if necessary, launches a brute force search of the very limited key space. It is available for Linux, BSD, Solaris, MacOS X, BeOS, and even Windows. OK, That's More Than Enough Background, How Do I Copy a DVD? You could just fire up K3b and select Copy a DVD from its menu — and that might work for you. It works in those cases where the libdvdcss library can quickly guess a working player key, and that seems to be well over 90% of the time! But if libdvdcss can't guess the key, K3b doesn't seem to allow it the chance to launch a brute force attack. The tool of choice is dvdbackup. Use dvdbackup to copy the file system of the DVD onto your file system, and then use K3b to burn the resulting directory structure to a DVD. Simply put the DVD in the drive and call dvdbackup. The -M option, for "mirror", does just that — it creates a mirror or copy of the DVD file system structure in the current working directory. It creates a subdirectory, the title as found on the DVD. Under there is the subdirectory VIDEO_TS that must exist on a valid video DVD. If it reports that it can't open the default device /dev/dvd, tell it where the device is with something like -i /dev/sr0 on Linux or -i /dev/cd0 on FreeBSD or -i /dev/cd0c on OpenBSD. You may also need to add -o . to explicitly tell it to put the result in the current directory. % dvdbackup -i /dev/sr0 -M -o . You can always download the source code for libdvdcss, dvdbackup, and K3b and build them from source. Build libdvdcss first, so the other components can use it. Error Messages — Don't Panic! libdvdread: Error cracking CSS key for /VIDEO_TS/VTS_02_1.VOB (0x001a0d60)!! libdvdread: Error cracking CSS key for /VIDEO_TS/VTS_04_1.VOB (0x001be5a0)!! libdvdread: Error cracking CSS key for /VIDEO_TS/VTS_05_1.VOB (0x001c6420)!! libdvdread: Error cracking CSS key for /VIDEO_TS/VTS_06_1.VOB (0x001c9280)!! libdvdread: Error cracking CSS key for /VIDEO_TS/VTS_18_1.VOB (0x0035d260)!! In that specific run of dvdbackup, 10-15 minutes was required to recover all the keys and the remaining 20-25 minutes for the data transfer of about 7.8 GB. The result played just fine. I think that what we see in the output are warnings that the initial and fairly trivial attempt to guess a file's key failed, and then it was found after some automated cryptanalysis requiring the reported number of seconds. You may not notice this, but one result of this process is a directory ~/.dvdcss/TITLE containing a set of files. Each file's name comes from the hexadecimal ID, and it contains the key for that file. Later runs of a libdvdcss program could simply read and use those keys. 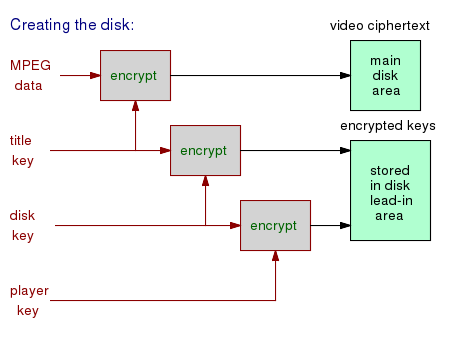 Some DVDs use the same key for every file, some pick a new key for every two or three files, some have a unique key for each file. In many cases the keys differ by only a single byte, possibly just incrementing from one to the next. What About K3b Burning Errors? Sony is notorious for having inserted malicious root kits in CDs, see the excellent detailed analysis by Mark Russinovich for background on this. The Sony malware is secretly installed and run without your knowledge or consent, and a hacker could use it to gain and maintain access to your computer. If the Sony malware is installed on a Windows computer, attempts to remove it will damage or destroy your operating system. The dvdbackup tool creates a subdirectory named for the DVD volume name, and then it creates two subdirectories within that, AUDIO_TS and VIDEO_TS. The AUDIO_TS directory will be empty. J00___5L.MP2 is 720x480 pixels, J00___5M.MP2 is 176x112 pixels, and J00___5S.MP2 does not seem to contain video data. As for the program PC_clickme.exe, which is automatically run if your Windows OS honors the AUTORUN.INF file, it contains some code which modifies your registry. Why does this program call RegSetValueEx() and RegCreateKeyEx()? I found that a copy of this DVD made with the K3b "Copy Medium" operation would not play in my Samsung DVD-1080P9. However, a copy made by using dvdbackup and then burning a DVD with just the full VIDEO_TS and empty AUDIO_TS directories would play just fine. My conclusion: The added programs and/or the lack of some data not copied in the K3b "Copy Medium" operation make for unplayable copies.